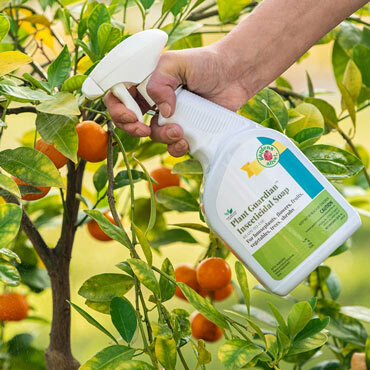 Plant Guardian Houseplant Insecticidal Soap is a contact killer for both insect and mite pests. It penetrates the body of pests and results in rapid death. It contains specially selected fatty acid salts (that is, soaps) chosen for effective pest control. It works quickly against the adult, larval and nymph stages of pests. Pupal stages of some pests (e.g., white fly) may also be affected. For use indoors and outdoors on vegetables, fruit and nut trees, citrus, berries, ornamentals, shrubs, flowers and trees in homes, gardens and greenhouses. Works best to control adelgids, aphids, earwigs, grasshoppers, lace bugs, mealybugs, mites, plant bugs, leaf hoppers, psyllids, saw fly larvae, scale insects, tent caterpillars, thrips, white flies, woolly aphids, and other listed pests.